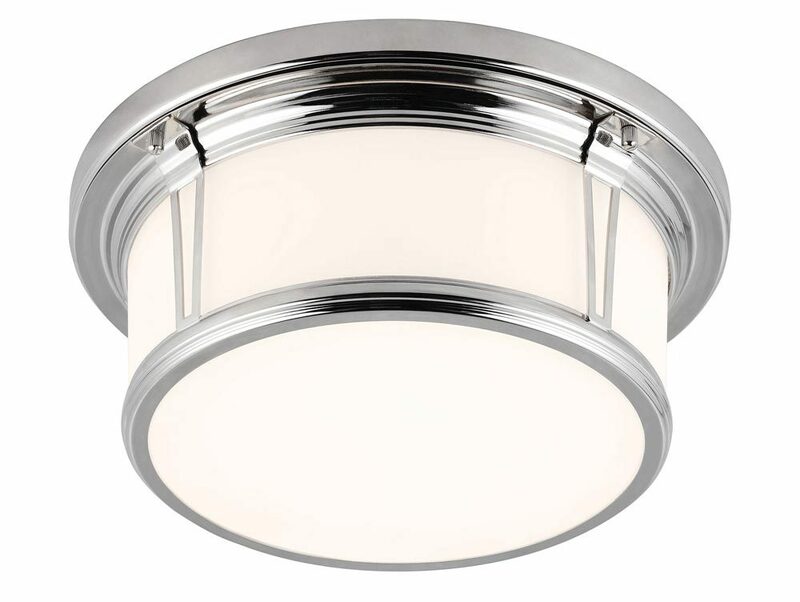 This Feiss Woodward flush 2 light medium bathroom ceiling light in polished chrome is rated IP44 and features vintage style with a contemporary twist. Flush mount and 34cm drum frame in bright chrome, with deep straight sided shade featuring metal cross braces, rim detail and etched opal white glass panels to softly diffuse light. If you are searching for a quality flush mount ceiling light to complement your bathroom, the Woodward is certainly one to consider. The smooth, linear lines make it suitable for a contemporary setting, whilst the retro style makes it suitable for traditional bathrooms too. This medium flush light has been specifically designed for use in bathrooms but can be used anywhere inside your home except wet rooms. Rated IP44, fully splash proof and suitable for bathroom zones 1 and 2. There is a coordinated three-light flush ceiling light available; please see below. This stylish light is supplied by Elstead Lighting and designed in the USA by Feiss, founded in New York in 1955. They have become well known over the years for their contemporary yet classic styling, quality and great original designs like the Woodward flush 2 light medium bathroom ceiling light in polished chrome and rated IP44 you see here.